We offer a ' Wedding Planning Support ' available via Skype, phone or face to face. The aim is to help newly engaged couples who lives overseas to plan the most magical and memorable wedding day in the most personal way possible given that they are not in the country.
' Wedding Planning Support ' is for anyone organising a wedding, whether they are recently engaged, in the midst of their planning or having last-minute panic. 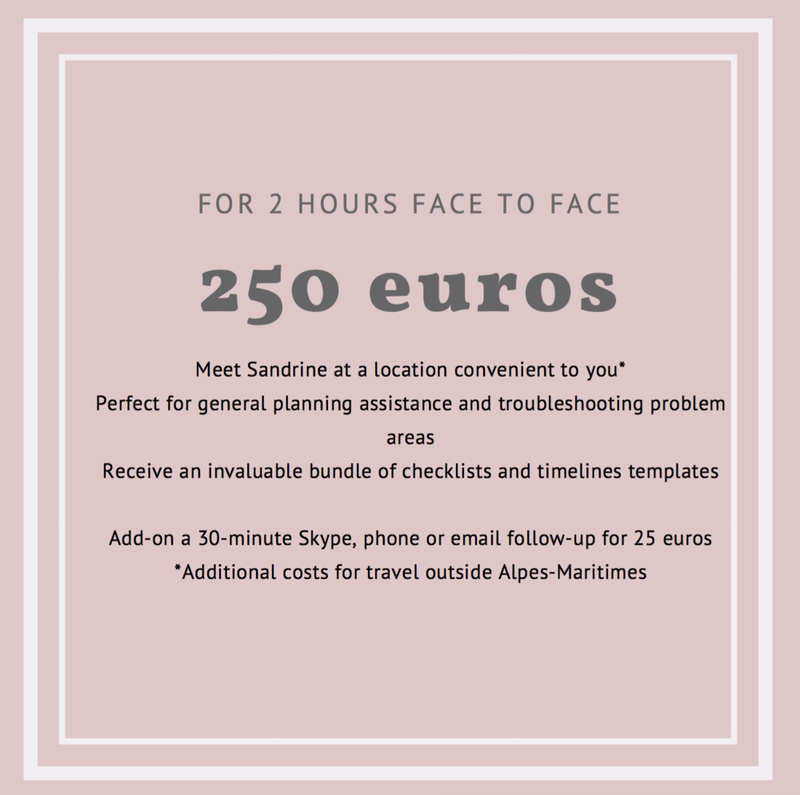 Sandrine, the expert Wedding Planner, can start you on your planning journey, be a support for busy brides, advise family members, give formal and informal etiquette advice, offer a listening ear to ease the stress, and provide expert help. You pay for what you need, from a brief phone call to a few hours in person. Sandrine offers expert, strategic and professional advice to help clarify your thoughts and advance your plans. Busy lives, family pressures, tricky scenarios, lots of decisions… wedding planning can be a big challenge and sometimes it is hard to find the right answers to your questions. ' Wedding Planning Support ' is the chance to speak to or meet Sandrine, and receive personalised advice, to a schedule that suits you, while avoiding the ties and expense of a full-time planner. 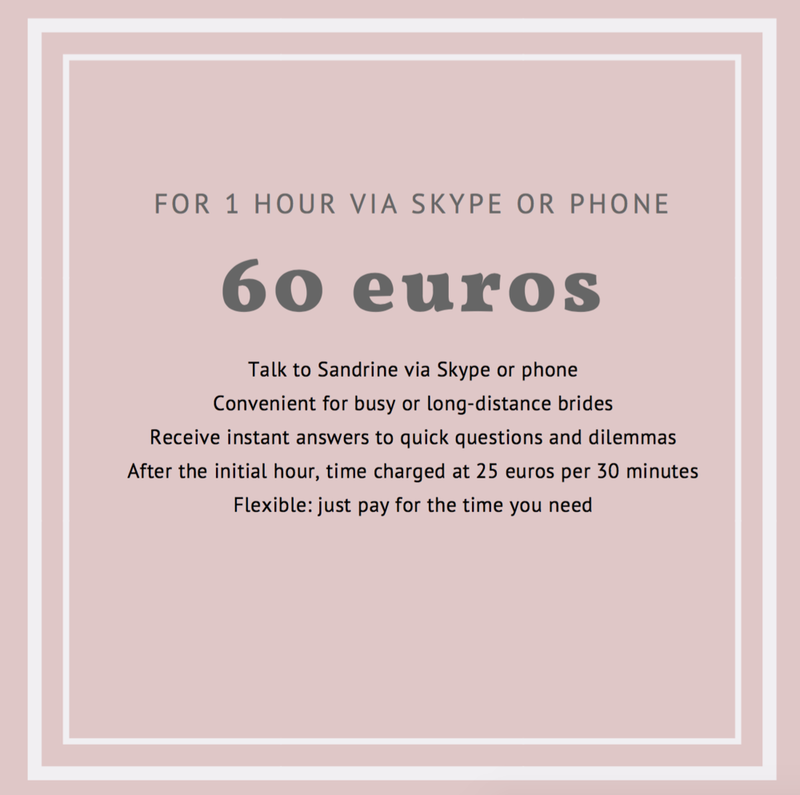 Due to time differences from country to country, we are very flexible and happy to arrange a Skype wedding consultation at a time that suits you. WHAT WILL WE COVER ? Sandrine also offers couples access to an online wedding planning service, a complimentary service that we provide to all our brides and grooms when you book your wedding with Lucky You Events. Some of the tools include: a wedding website with your own personal '.com' URL, Guest list & RSVP manager, a Budget planner tool, Seating Planner: drag 'n' drop guest names onto seats.